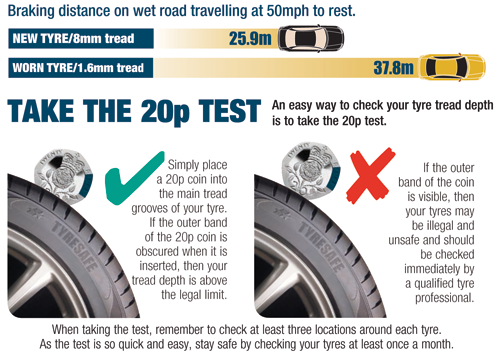 Get into the habit of checking your tyres on a regular basis they are the only thing connecting your car to the road. Checked at least once a month. Or on a plate on the driver's door sill. Check you tyre pressures when the tyres are cold i.e. when you have travelled less than two miles. Tyres degrade thorough exposure to heat, sunlight and rain. The amount of damage depends on the exposure and the severity of the weather. Watch out for the signs of perishing. There may still be plenty of tread still left on the tyres but perished tyres are still unsafe due to the increased risk of a tyre blow out or rapid loss of air in the tyres. Perished tyres have cracks that appear like 'crazy paving', with lots of tiny hairline cracks running this way and that, noticeable on the wall of the tyre, near the rim, where tread pattern begins or between the groves in tread. The legal requirement is 1.6mm but many manufacturers recommend changing before this at either 2mm or 3mm. 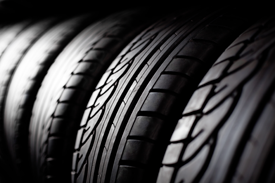 Incorrect tracking leads to uneven and accelerated tyre wear. Get it checked every 6 months.